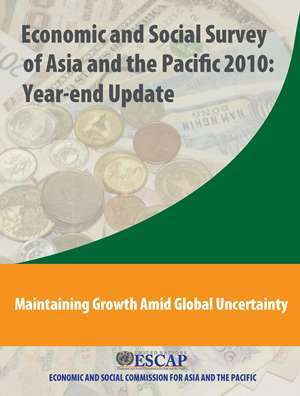 Economic and Social Survey of Asia and the Pacific 2010: Year-end Update "Maintaining Growth Amid Global Uncertainty"
2010 has seen an impressive recovery of the Asia-Pacific region from the Great Recession of 2008/09. Led by the large economies of China and India, output growth in the region rebounded in 2009 and gathered further strength in 2010. But the region is faced with a weakening of growth in the developed economies which are grappling with a combination of weak household demand and fiscal retrenchment. With developed economies putting greater reliance on monetary policy to stimulate growth through major expansion of liquidity, many developing economies in the region are having to contend with a deluge of short-term speculative capital flows causing their exchange rates to appreciate, asset bubbles to form and price pressures to build up especially of food. The Year-end Update of UN-ESCAP’s annual flagship publication, Economic and Social Survey of Asia and the Pacific 2010, considers the implications of these challenges for policy-makers in the region. The principal message of the Update is the need for the countries in the region to adopt a cautious approach in ending of fiscal stimulus packages while building in the medium term alternative sources of demand in the region, both domestic and external. For the former, the Update looks to reduce poverty and boost demand combined with more investment in infrastructure. For the latter, it highlights the need to deepen regional integration in the areas of trade and finance and more broadly in policy coordination in order to face the challenges confronting the region in 2011 and beyond. Management of capital flows is another important challenge for the region’s policy makers for maintaining financial stability.